Lakeshore Aviation is proud to offer quality aircraft rental at affordable prices. Although brand new airplanes are nice to fly, they're also expensive. We currently offer well-maintained, nicely-equipped aircraft at a price you can afford. People drive from miles around to save on their rental and flight training expenses. 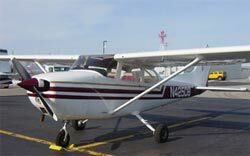 Stop in and check out our Cessna fleet including two Cessna 172's, a Cessna 150 and a Savage Light Sport Taildragger aircraft. All have nice paint and interiors that you'll be proud to fly in. 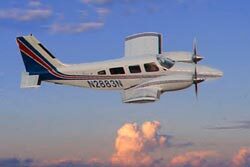 The Cessna's are full IFR with digital NavCom's and GPS receivers with moving maps. The two 172’s are equipped with full color Garmin 430 GPS’s. Intercoms allow for easier communication with pilots, passengers, instructors and air traffic controllers. We are also proud to be the only Seaplane Flight School in the state of Wisconsin recognized by the Seaplane Pilots Association, and operate a 1979 Cessna 172XP (210HP) on Wipline 2350 Amphibious floats for instruction. Sorry, due to insurance requirements, solo rental is not available, but you'll still have a ball flying with our instructors. Due to fluctuating fuel markets hourly rates may vary, please call us for current pricing. Standard insurance terms and deductibles apply, please call us for information. 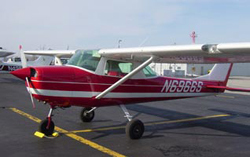 Both of our Cessna 172's are well-equipped, professionally maintained, competitively priced and reliable. They have new paint and a clean interior, and are full IFR with Garmin 430 GPS, moving map, dual ILS/VOR receivers, full 4-place intercom and push-to-talk switches. Safety seatbelts and shoulder straps are standard. Weekend or extended rentals invited. Contact us for more information or to reserve the airplane for your next flight! Our Cessna 150 is a vintage 1960's model C-150H. It has new paint and a very clean interior, and is full IFR, including ILS, VOR, Intercom, Push-to-Talk switches and GPS moving map. It's a cute little 150, and features "Corvette" style leather seats. Safety seatbelts and shoulder straps are standard. It rents (wet, including fuel) at a very affordable rate. Great for cost-effective flight training. Contact us for more information or to reserve the airplane for your next flight! The Savage Cruiser is a cute, 2-place “taildragger”, much like the historic Piper J-3 Cub. It fits into the Light Sport Aircraft category, so it’s perfect for training for your LSA Pilot License. It’s also great if you already have your license and would like to add your Tailwheel Endorsement. 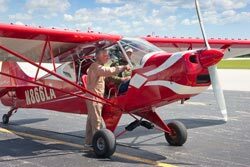 We have one of the most experienced Tailwheel instructors in the area on staff, and the plane is fun to fly with docile handling characteristics. Due to the cold weather, this plane isn’t available during winter months. For the ultimate “fun” experience, jump in our seaplane, fly low and slow and experience the thrill of landing on water! Nationally recognized by the Seaplane Pilots Association, we operate a 1979 Cessna 172XP (210HP) on Wipline 2350 Amphibious floats for instruction. With retrabtable landing gear, it lands on both runways and water. If you don’t have them already, training also qualifies you for FAA’s High Performance and Complex endorsements. The plane is also full IFR featuring a Garmin 430 and autopilot, so if you’re instrument rated, we can also get you current in that. Sorry, due to insurance requirements, solo rental is not available, but you'll still have a ball flying with our instructors. If you’re looking to move up in skill and ratings, our twin-engine Seneca is available for flight training. Considered one of the most manageable light twins, our Seneca is full IFR with a Garmin 530, fully coupled autopilot, XM weather, traffic and all the other amenities you’d expect from a nice twin-engine plane. Call Chief Pilot Curt Drumm for more information.